Provide automated options to reduce churn and track exit feedback. Sign Up with today Don't have stripe? My trial wasn't long enough. Extend your trial another 14 days. I found another app I like better. You did?! Why is it better? I'm lost and I need help with my account. I don't need this product anymore. Pause my subscription for 3 months and notify me when it's time to come back. Sorry to see you go! What could we have done better? Replace your “Unsubscribe” button with customized actions to prevent users from leaving and collect their feedback. 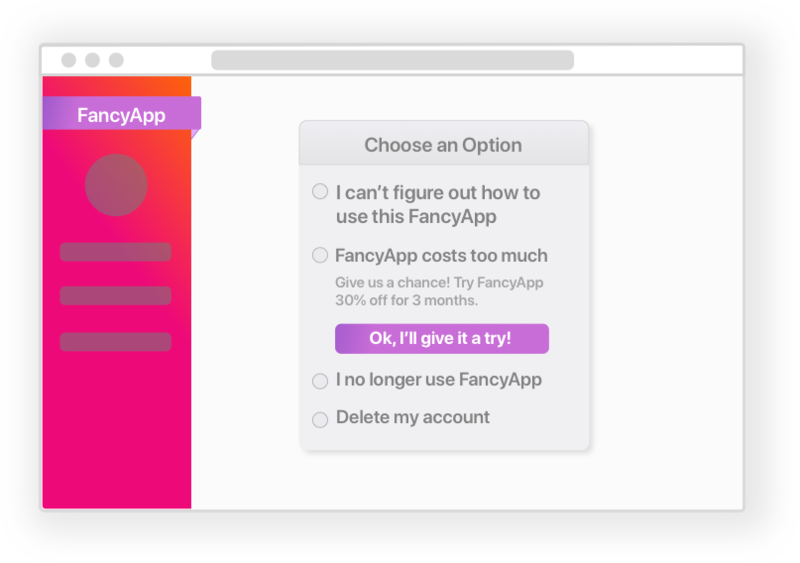 Create customizable options and actions which integrate with Stripe, email, and your application. Automate processes like contacting support, extending trials, collecting feedback, and more. Understand why your users churn and how to stop it. 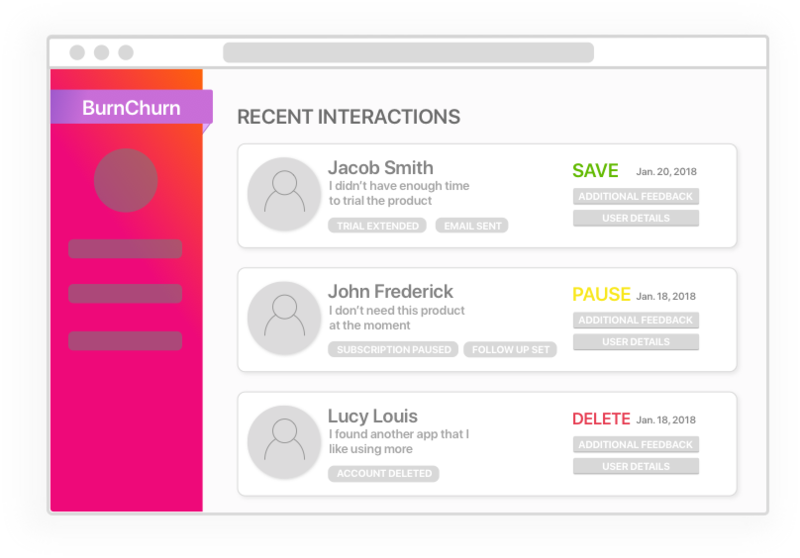 Easily view interactions and activity, measuring and intervening before it’s too late. 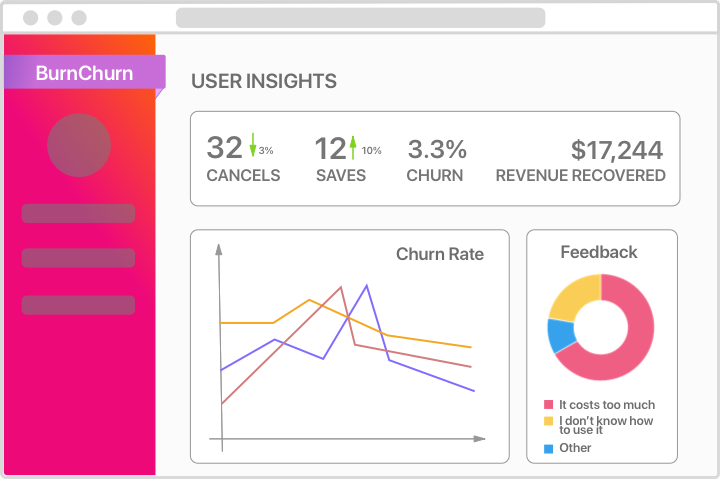 Measure your progress reducing churn and retaining users through an intuitive and easy to understand dashboard. Track MRR, user churn, revenue saved, and more. Just add one line of code to your application. Choose from variety of settings or add custom CSS. Intervene before you lose the customer. for updates and new integrations. Recover more revenue than BurnChurn costs monthly or we'll refund the difference.